Geographically, Morocco is a long way from Mexico. It’s halfway around the world, on the edge of Africa, with different religious and cultural traditions. But Rosarito’s Mi Casa Supper Club(Av. Estero 54) is working to bring Morocco closer. There are geographical similarities between Baja and Morocco—a Moroccan friend of mine has said that the coast north of Punta San Miguel reminds her of Morocco’s Atlantic coast, where she grew up. And there’s also a surprising culinary compatibility. We assume that the “Med” in BajaMed is European: France, Italy or Spain. Chef Bo Bendana Sein, though, reminds us that Morocco is on the Mediterranean, too. Take, for example, her phyllo briwat with turmeric crab. Briwat are Moroccan deep-fried and stuffed turnovers that are traditionally made with a phyllo-like pastry dough called warka. This was a classic Moroccan dish right up until Bendana chose to use incredibly sweet local crab and pair it with jalapeño-citron sauce. 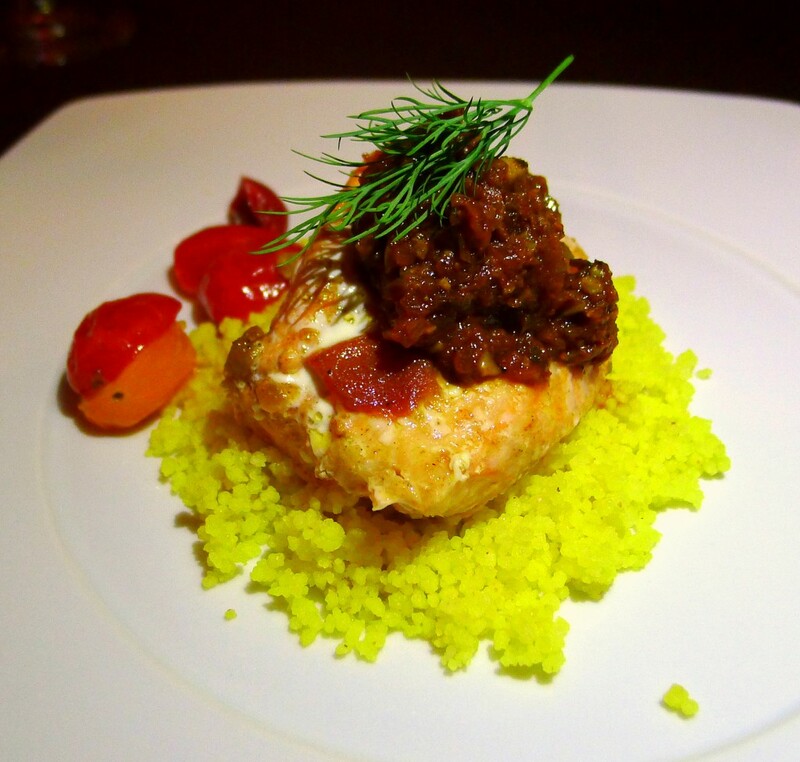 It’s overtly Moroccan food adapted to the local ingredients and culinary milieu. Many of the best dishes at Mi Casa are starters. Bendana again shows her deft touch with savory pastries in a baked mushroom tartlet with caramelized onions and ricotta cheese, the onions serving to tie together the other ingredients. Not quite as good was the tres chiliesCaprese salad with heirloom tomatoes, Serrano pesto and adobo baby mozzarella. It was an utterly gorgeous dish—maybe the best-looking Caprese salad I’ve seen. But as lovely as those baubles of heirloom tomatoes were, they didn’t taste quite as good. Colorful? Yes. But they were still February tomatoes. No dish was better than the layered vegetable ratatouille with broccoli purée and tomato-pine-nut sauce. If you’ve seen the Disney movie Ratatouille, you know this dish. It’s the one chef Thomas Keller of The French Laundry created for the film, served to the restaurant critic. Bendana’s presentation might not have quite reached the precision of Keller’s (or Remy’s), but whose does? Certainly, there’s no loss of precision whatsoever in the flavors and textures. This is not the homey ratatouille of a French child’s (or critic’s) memory. As you taste the bright vegetable flavors—with their firm, precise textures—they come together as a single, unified whole. The broccoli purée and the tomato-pine-nut sauce give the dish a luxurious richness and add layers of flavor. Mi Casa’s main courses are not quite at the same level. A chicken-roulade dish was overly dry, its gorgeous vegetable accompaniments overcooked. Conversely, the beef in the bourguignon was undercooked and tough. But baked wild salmon with chermoula, preserved lemons, green olives and a saffron-scented couscous was perfectly executed, with exotic Moroccan flavors and textures bringing it to a different level. Saffron-scented couscous made another appearance with slow-cooked lamb in a prune-based mole: a perfect melding of Moroccan and Mexican. The pairing of mole with the lamb seemed angular at first, but the couscous rounded it out perfectly.